Over the years, turtlenecks have been sniggered at and considered boring and ordinary. But times have changed and turtlenecks are now not only comfy but stylish as well. However, we know some of you might still think going out wearing a turtleneck is utterly outlandish, which is why we have come up with some chic ways you can work one and look like a true fashionista. Read on for some turtleneck glamspiration! Remember Audrey Hepburn’s famous turtleneck sweater? Ace a classic look by pairing a black turtleneck sweater with a tailored trousers and leather loafers. 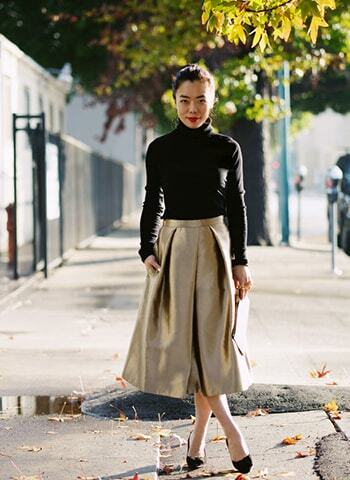 For a chic and feminine ensemble, team your turtleneck sweater with a midi skirt. You can also try it with a skater or a maxi skirt. Pair them with boots or pumps to complete the look. Check out how Kate Bosworth wore a turtle neck sweater with overalls and totally nailed the casual chic look. Team up this look with a statement eye-wear and a bag just like Kate and you are ready for some weekend fun with friends. To get that on-fleek off-duty look choose a basic sleeveless turtleneck top and wear it with high-waist trousers. This one is a must try. 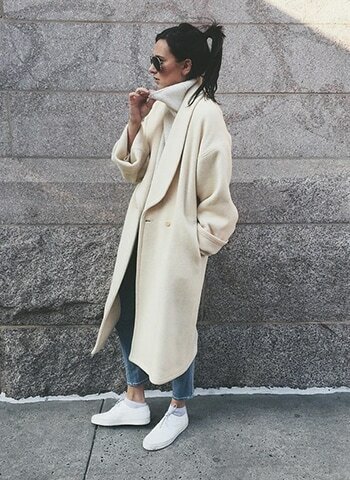 Keep those winter chills at bay by layering your turtleneck sweater with an oversized coat. Can it get any cozier than this? Throw a sleeveless shift dress on a black turtleneck and look effortlessly stylish. This one will get you all the attention on your next formal event.